This sponge features an extra fenestration which allows it to lay flat when wrapped around a drainage tube.Without it, the sponge will pucker, decreasing effectiveness byallowing fluids to pool around the drain tube. 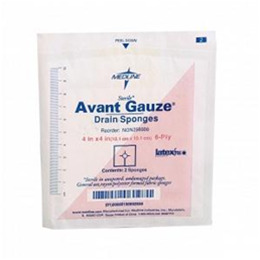 Includes all the benefits of non-woven Avant Gauze. Each 6-ply rayon/polyester sponge is highly absorbent, low-linting and fast wicking to wound beds. Sterile.